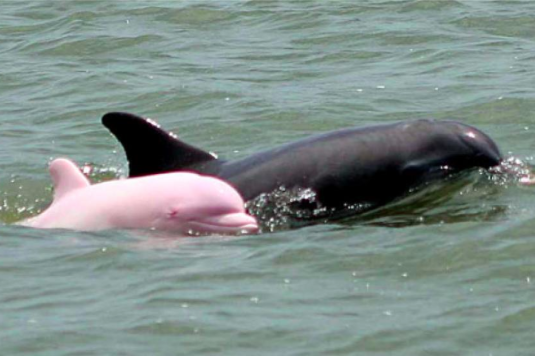 Pinky the albino bottlenose dolphin was first spotted in Louisiana's Calcasieu Lake in 2007. The vast world of wildlife never ceases to provide entertainment for humans bouncing around on the Internet. Two of this week's animal anomalies making rounds are particularly noteworthy because it's likely most people haven't seen these creatures before. Starting off, the next time a kid asks you if fire-breathing dragons really exist, you won't be able to automatically dismiss the question as the stuff of myth and fairy tales anymore. 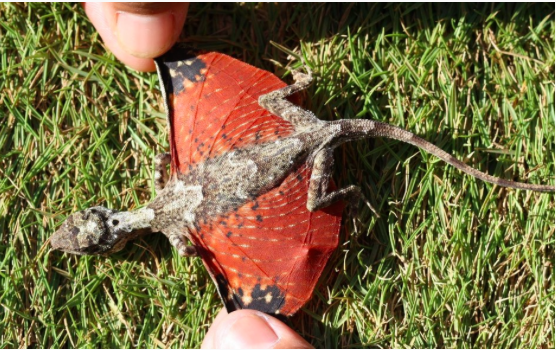 It may not be fire-breathing, but the tiny Draco volans is a lizard with wing-link appendages that can soar more than 30 feet in one jump, according to MyScienceAcadamy. Fortunately, we don’t need to worry about them pillaging any towns any time soon (Smaug, anyone?). Dracos only reach about 8 inches (20 centimeters) long. Also, they don’t breath fire (alas). Draco Volans is native to Indonesia, Malaysia and the Philippines, so anyone worried about one of these guys flying into their hair someday can stick to worrying about bats. Secondly, in Louisiana, an extremely rare albino dolphin named Pinky was sighted over Labor Day weekend in Calcasieu Lake, Newsweek reports. First spotted in 2007, Pinky is one of just three albino bottlenose dolphins to be found in the Gulf of Mexico, according to records kept by the National Oceanic and Atmospheric Administration. Though there are populations of pink river dolphins in the Amazon, Pinky's uniform color and albino status make her a special case. Erik Rue of Calcasieu charter service has made photographing Pinky a hobby over the years, noting that she has grown to between 6 and 7 feet long since he first saw her. As a result of his photos, locating her has become a consistent request on his boat trips. While it would not guarantee pink offspring, rumor has it that Pinky may be pregnant.